I have kids..and well..they aren’t the most organized people on planet Earth, but who REALLY is? 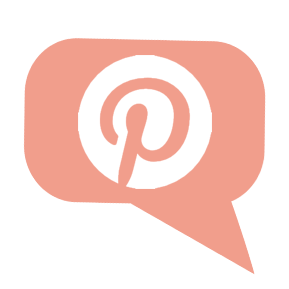 If you’re like me, and you’re a little tired of always tripping over toys, try one of these fantastic toy storage ideas! They’re super cheap, and your home will look so much better with all toys organized. 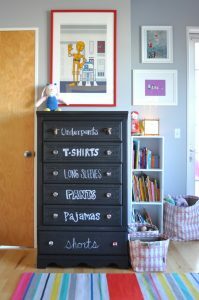 Although this was painted for clothing storage, it could work for toy storage as well. This was painted with chalk board paint, so you can customize it to say whatever you would like! 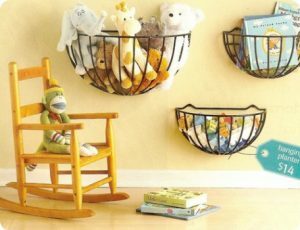 If you are running out of storage space in your play room, try to store your toys and stuffed animals in wall-hung baskets. 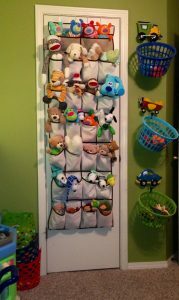 Pick up tons of over-the-door shoe organizers because they are great for ANY kind of toy storage. Here, various stuffed animals are tucked in the pockets so they are off the floor! If you can swing it, try and incorporate built in storage units around your home, wherever there is room. Label them so your kids know right where everything is! It’s time to put your carpentry skills to good use. 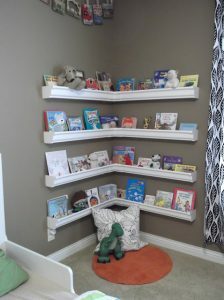 Make the most of any awkward corners in your home with a few shelves that fit in the corners seamlessly! Stash books and other light weight toys on the shelving. Those over-the-door organizers are making another case for their usefullness! 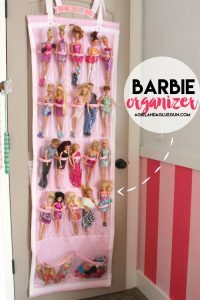 Stash your Barbie dolls (and all of their clothing) in an over-the-door organizer so you’ll know right where everything is. Keep night time neccessities right where you need them with this bedside organization pouch. 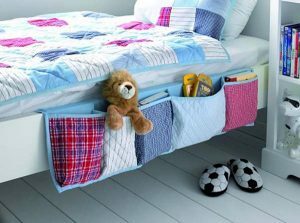 Nothing will get lost with a bedside organizer like this! 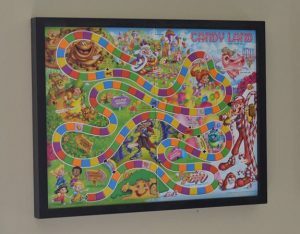 Frame your gameboards so they look like cute art. Simply take them down off of the wall when it’s time to play. But make sure you stash all of the game pieces together in a zip lock bag attaced to the back of the game board. Puzzle boxes take up tons of storage space. 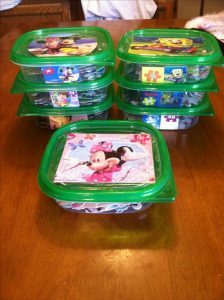 Instead of hanging on to those annoying boxes, stash puzzle pieces together in tupperware containers that stack. Attach a picture on the lid so kids know exactly what you are making! 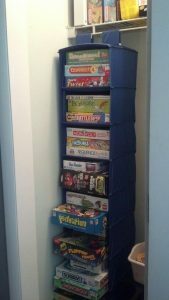 Keep your games organized and in easy reach by storing them in a hanging cubby organizer. 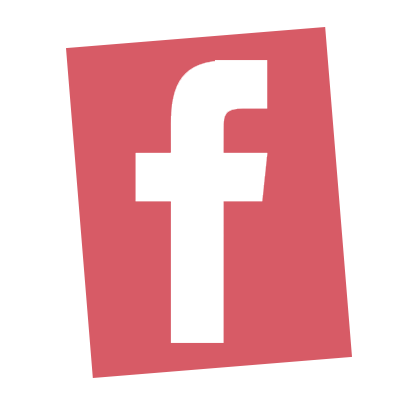 Purchase one here!